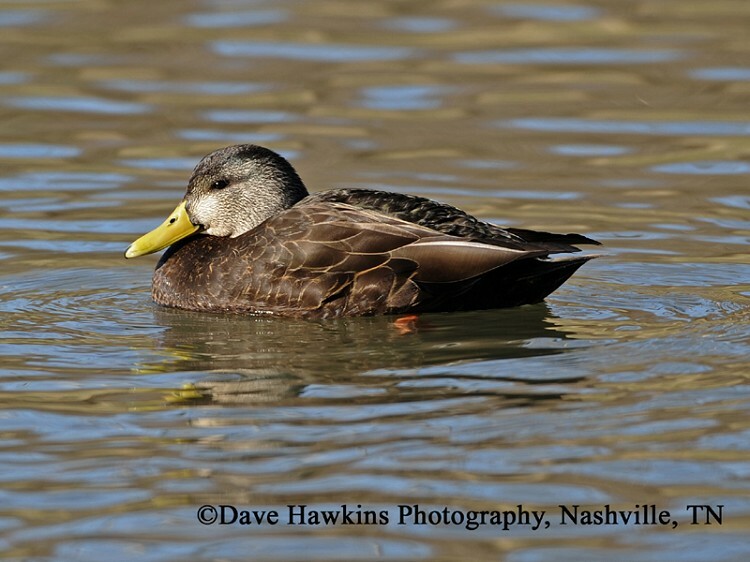 The American Black Duck is a common migrant and winter resident across Tennessee, with just a few scattered breeding pairs in the state. This is a duck of forested wetlands, lakes, ponds, bogs, and salt marshes and primarily breeds across northeastern North America from Canada to eastern Virginia. In winter they can be found from southern Canada to the Gulf Coast and northern Florida, westward to central Texas. Description: Male and female Black Ducks are similar to female Mallards in appearance, but Black Ducks are darker overall, and have a dark tail. The male has a greenish-yellow bill, and the female’s bill is dark olive. In flight, they have a purple wing-patch on the upper-wing with no white edges, and the white under-wing linings contrast sharply with the dark body. Voice: Their quack is similar to a Mallard’s. Female Mallards looks very similar, but are paler overall and have an orange bill. In flight, there are bold white borders to the blue wing-patch on the upper-wing, and the belly and tail are whitish. Habitat: American Black Ducks breed in a variety of wetland habitats, from salt marshes to beaver ponds, river islands, and boreal bogs. They winter primarily in salt water along coasts, but also in a variety of freshwater areas inland. Diet: Seeds, roots, stems, grain, aquatic plants, aquatic insects, crustaceans, mollusks, and some fish. Nesting and reproduction: The male does not participate in nesting activities after incubation begins. Clutch Size: Usually 9 eggs, with a range of 7 to 12. Incubation: The female incubates for 26 to 29 days. Fledging: Nestlings leave the nest within hours of hatching and remain with the female until they can fly at about 60 days. Nest: The nest is built of grass and weed stems, and lined with down. It is usually placed on a mound of earth, concealed in vegetation. Status in Tennessee: The Black Duck is a common migrant and winter resident in Middle and West Tennessee, less common in East Tennessee. It is a very rare summer resident, with only a few nest records scattered across the state. Individuals begin arriving by late August and depart by mid-May. The American Black Duck is able to interbreed with Mallards and has taken over some breeding locations. Due to a significant decline in population numbers, the hunting of American Black Ducks was restricted in 1983. The United States and Canada formed the Black Duck Joint Venture in 1989 to restore this species (See link below). The oldest known American Black Duck in the wild was 26 years, 5 months old. Best places to see in Tennessee: Black Ducks are most numerous in Tennessee from November into March. They can be found on reservoirs, lakes and wildlife refuges primarily in Middle and West Tennessee. Longcore, J. R., D. G. McAuley, G. R. Hepp, and J. M. Rhymer. 2000. American Black Duck (Anas rubripes). The Birds of North America, No. 481 (A. Poole and F. Gill, eds.). The Birds of North America, Inc., Philadelphia, PA.